Remember bands like The Clash and The Ruts? 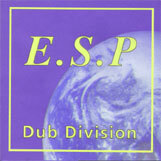 E.S.P plays an attractive mixture of rock, reggae and ska. Rock is the band's main inspiration but reggae has always had a big influence on E.S.P's music. E.S.P's favourite artists include Lee Perry, Scientist and Augustus Pablo. 'Dub Division' is a selection of dubs and soundscapes, all performed and mixed live-on-the-spot. Listen to / download complete 'Dub Division' tracks in mp3 format (click the red links below). Pump up the volume, turn up the bass and enjoy!